Overview: This is another beautiful trail out in the area around Agua Caliente Hill, at the far east end of the Catalinas. Like the other trails in this area, the forest service makes no mention of it - it is unsigned but totally obvious and well-hiked. This particular trail hikes the La Milagrosa ridgeline out to the junction with the Bellota section of the Arizona Trail. Hike: This hike begins at the intersection of N. Avenida de Suzenu and Horsehead Roads. Walk around the gate onto Horsehead Road and blast out the initial boring segment of this hike, a roughly 0.6 mile or so walk down the road to the mouth of La Milagrosa Canyon. Near the end of the road, you will walk past the intersection of Wentworth road, and then the trail drops across a little wash (which will flow after rain) and crosses over a small gate that will likely be trampled over. After climbing up the other side the trail now obviously is heading towards the converging La Milagrosa and Agua Caliente canyons. The first left is a spur to an old, abandoned shack which you should ignore. The real trail contours down and to the left beyond the remnants of the house. A quick descent takes you to the intersection of interest. Take a left here onto the La Milagrosa route. A right leads towards Agua Caliente canyon. The left you took will almost immediately start you climbing up the western flank of La Milagrosa Canyon and the views are almost immediately sweet. At about 1.3 miles from the start you come to a hikers gate on the climb up the canyon flank. Pass through here and continue your ascent up the western ridge of the canyon. Before too long you reach the highpoint on this side of the canyon (with spectacular views up the canyon to prove it) and begin a short earnest descent back down to the canyon bottom, at the location of a great rock shelf sitting across the canyon bottom. At times of water flow, any number of little falls will spill off this excellent slab of rock. Cross over the canyon bottom to the east side and pick up the trail to climb up the east wall of La Milagrosa canyon and access the La Milagrosa Ridge that ultimately separates La Milagrosa from Agua Caliente canyons. It's a nice, brief and somewhat steep climb up to the ridge. The trail will not head northeast along the ridgeline for some way. At about 2.5 miles from the car a distinct, but unsigned intersection will present itself to you. The right fork clearly heads towards Agua Caliente Canyon which falls away hundreds of feet to your right and is the route to take for the loop hike described by Red Rover. You want the LEFT fork, which is the continuation of the La Milagrosa Ridge trail. This intersection is around 32.30362 N, 110.6977 W.
Continue hiking along this excellent route further out into the hills between the Catalinas and the Agua Caliente Hill formation, climbing up or skirting several ridgeline points along the way. The views ahead and to the right are always great, and to the left the views down into La Milagrosa Canyon are generally splendid. Ultimately the trail finally curves north and begins a descent towards the top of the canyon, and descends down to it's floor. Again, when water is running this is a wonderland of cascades and falls. A broad creek crossing after this spot will bring you to an unmarked, unsigned intersection with a wide, sandy trail - the Bellota Trail, a section of the Arizona Trail. This is the end of the La Milagrosa Ridge trail, never signed or marked in any way yet truly excellent nonetheless. It is about 5.25 miles from your car. Return the way you came. 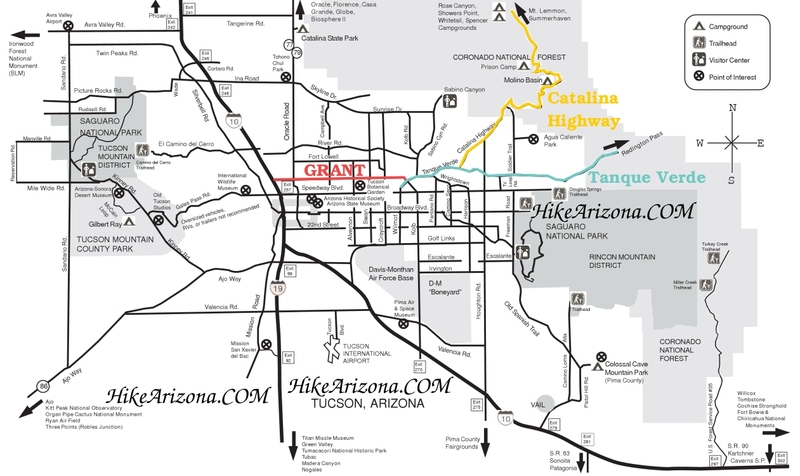 Take Catalina Hwy toward Mt Lemmon and turn right on Snyder Road and follow it east. Turn left on N. Avenida de Suzenu to the intersection with Horsehead Road. There are usually a few cars parked along Suzenu at the intersection. The trail starts at Horsehead Road. This is actually a residential area, but the residents have agreed to allow foot traffic to get to the public land, so please be respectful. You must park where Horsehead Road and N. Avenida de Suzenu intersect.